I'm a biker. I'm a bike enthusiast. Boston is a great city for biking and I do so year-round. I'm proud to say that this November I'll be 3 years without a car (and mind you, about 9 months of that was in car-dependent Atlanta)! But this blog is not the place for me to go on about how biking is the cheapest and fastest way to get around the city. How it's great for the environment and great for your body. How it keeps you in touch with the weather system and keeps you from parking fees, tow fees and time wasted looking for a parking spot. It isn't how all of the coolest people you'll meet ride bikes. So I'll just talk about my gear and how to put a box on the back. After the jump: details on gear, instructions for the box, gallery of love for my bike and a look-what-you-can-do-with-your-broken-box. Lots of photos. I can't take credit for picking out my frame, but the person who did knew my tastes well. It's old Fuji frame and has its original silver paint. The overall look I'm going for is that of a bookish-English bike, if there could be such a bike. I keep the details in silver or honey leather. 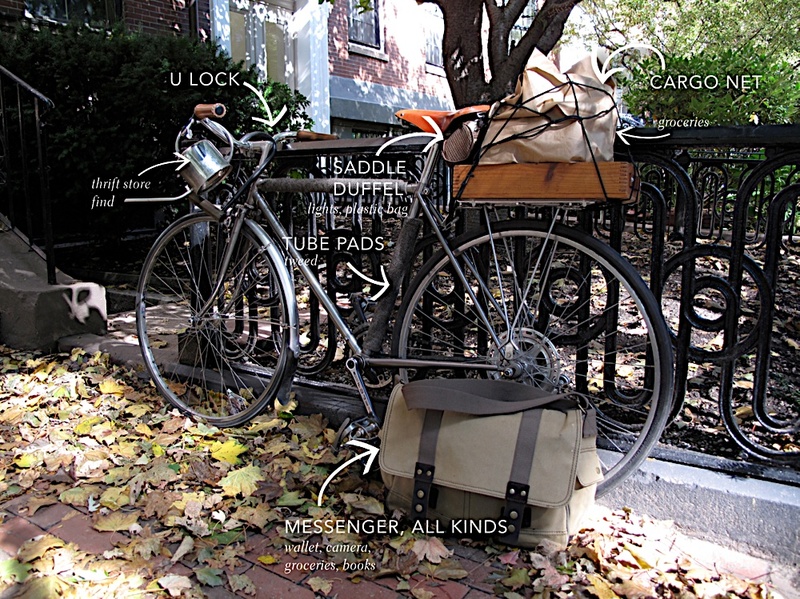 Obviously if I'm going somewhere to get many things or carry many things to a place I grab a messenger. I have too many. I also always ride with my computer in my bag because I want it as close to my body as possible, and really, it's the safest place. I made these in tweed for a Tweed Ride here a while back and I haven't taken them off. Tube pads keep your paint from getting nicked when you're locking up to metal sign posts and what not. They also look pretty sweet. Also, as you can see, I gave away one so I've only got two tubes covered. I may have to make another set because I'd like to have them all matching, it's my bike's tweed jacket. I made this for the Tweed Ride as well but need one anyways. I keep my lights in here (only a few percentage points safer than leaving your lights out) and a plastic grocery bag for when it rains I can cover my Brooks saddle. I've got it on my to-do list to make another one, yellow velvet, and post about it.... so I hope that happens. I've got a medium sized one, and I wish I had the shorter one, but since I'm $40 invested in what I have, I won't be buying a new one until I have to. I keep it on my handle bars, which is not a good place because it can jam up your turning - but it doesn't happen very frequently. I'm not a dude with huge pockets to put it in, I don't want it flopping in the box, I don't want it hanging on the tubes, I don't like making anything I'm carrying on my back heavier than it needs to be so on the handle bars it goes. I'm telling you, with this box and a cargo net you can carry anything. Anything. There are some photos below showing some of the different things I've carried on it, sadly there are no photos showing some of the craziest things I've carried on it. I was first inspired by this bike, by Fast Boy Cycles. It's gorgeous and simple. My bike use to be as simple but is going through a transition to a geared bike and is no longer simple. I did not want the box to be on the front because I knew I'd load it up with stuff and having the heavy part of the bike be the same as the part of the bike that pivots is not at all fun, to me. I also knew that I had boxes very similar to that in my possession already. A wonderful store here, Windsor Button, has a wall of wooden boxes filled with buttons, and for whatever reason they were selling some of the old boxes. I had a few because I use them in the kitchen. I bought a simple silver (aluminum) back rack and attached it as normal. I then placed the box on the rack and marked pairs of dots in six places. Each pair of dots surrounded one of the rungs of the back rack. You'll be attaching the box to the rack with zip ties and you'll want to attach to the rack in locations that secure it from moving in both directions. Each back rack will be different so yours may not look exactly like mine. I also added two layers of foam sheets (easy to get from a craft store) between the metal rack and the box to keep it quieter and act as a sort of shock absorber. Secure with zip ties like in the photo below and trim off the tail. I originally added the handle purely for looks; I had a bit of extra belt from this project. After I made it, I realized it was the perfect place to clip on my back light. You'll need a bit of leather, a leather punch, two screws, two washers and two wing nuts. Determine how long you'll need it to be and how much you want it to pucker out. Drill holes in your box and punch them in the leather accordingly. Here are some shots of my bike (at different stages of box, saddle, fender) in different situations. Just a little love gallery. 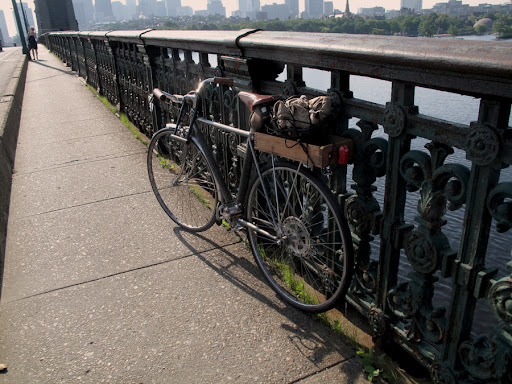 I've taken this bike on short trips all over the city as well as from Boston to Provincetown on the Cape and from Boston to Maine. I take it on the train with me to get to beaches and sometimes just to have it with me when I'm in another city visiting. And finally, I recently broke my box (I dropped my bike) so I put a new one on. Then I found this use for the one with the missing side: it now hides my laptop and lifts my monitor. I love it when things work out like that. Oh my goodness this is so great! I wish I could ride my bike to work! Maybe I could find a job closer to home next year when school starts again (I'm a teacher). I LOVE your tube pads! I want to crochet some for my bike! Absolutely lovely! LOVE the leather handles. And the tweed tube pads on your sweet ride. I have an antique egg crate I'm using on my back rack, and I made DIY clamps with hardwood trim and thumbscrews to attach it to the rack, instead of using zip-ties. It's amazing how much stuff you can carry with a good box! Great post! I love that box on your rear rack! Very creative. Are you going to put on a front basket too?